Walking through the historic streets and squares of the Spanish city of Salamanca, there is no way a person can not be impressed by the beautiful building of the Anaya Palace. This ancient building, situated on the homonymous square Anaya is distinguished by its ancient architecture. While all of Salamanca is an example of Renaissance architecture and in particular, the style typical for the region Plateresko, the palace Anaya is one of the smaller buildings, designed in neoclassical style. As such, Anaya Palace is defined as one of the greatest works of Spanish neoclassicism. It is located near the Cathedral in Salamanca. 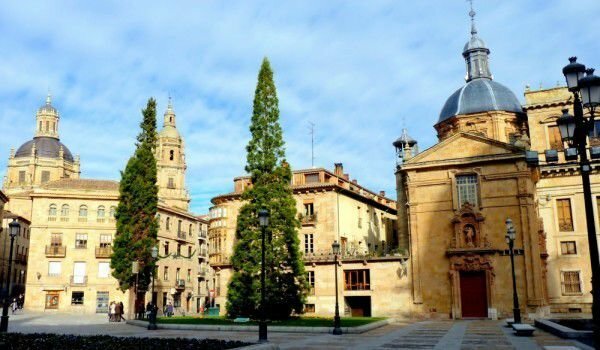 The beautiful and spacious square in front of the castle is a particularly pleasant place during the summer months when many students and alumni of the University of Salamanca gather here. Anaya Palace is known as Colegio Mayor de San Bartolomé or former College St. Bartholomew. At present, Anaya is one of the buildings of the University of Salamanca, as it housed the Faculty of Philology. The building was built in 1411 by order of Diego de Anaya Maldonado. For more than three centuries it functions as College St. Bartholomew, where special education students and noble families enjoyed a special relationship, away from the noise of the University. This continued until 1760 when the 15th century building was demolished, for palace Anaya to be built. It is assumed that the Lisbon earthquake made the old building unusable and therefore José Cabezas Enríquez ordered the construction of a new palace. Architects of Anaya were two of the most prominent artists of the 18th century in Spain - Juan de Sagarvinaga and José Hermosilla, who designed a masterpiece of neoclassical architecture. The main entrance of the palace Anaya has references to Greek architecture. Is dominated by a large staircase with four Ionic columns, above which is a large triangular pediment crafted. You can see the crest, and many windows of the four levels of the castle. Inside the palace Anaya is particularly impressive is the largest gallery on two levels, at the center of which can be seen a large bronze bust of the writer and philosopher Don Miguel de Unamuno, the work of Victorio Macho in 1930. The lower and upper gallery is outstanding with a total of 32 in its Ionic columns. Between the two levels of the gallery is a large and beautiful staircase, where they actually put the figure of Don Miguel. Anaya worked as a college until 1798.